BT Sport pundit, Chris Sutton, has told Chelsea to sack manager Maurizio Sarri, for resting Eden Hazard against Cardiff City on Sunday. Hazard and N’Golo Kante were both named on the bench for their 2-1 win in Wales. But Sutton says the Chelsea board “must be running out of patience” with Sarri. “Maurizio Sarri got lucky in Cardiff. If it were not for the assistant referee, Chelsea would have been fortunate to escape with a point. “Sarri may get lucky again and win the Europa League. 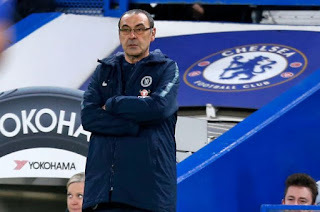 Even if he does – securing Champions League football in the process – this abject performance only highlights why he cannot be the man to lead Chelsea next season. “His decisions are becoming increasingly erratic. “There are no easy games at this stage of a Premier League season, especially against a Cardiff side battling against relegation, so why leave out your best player? “If Sarri wanted to rest Eden Hazard, would it not have been better to start him, win the game early on and then take him off with half an hour to go? “The reaction of the Chelsea supporters who made the trip to South Wales shows they have lost faith in their manager. “If they haven’t already, the board must be rapidly running out of patience, too,” Sutton wrote in the Daily Mail.